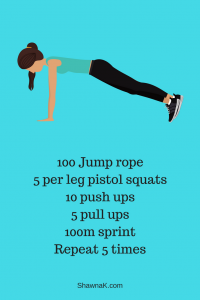 Quick body weight workout anyone? I always take my jump rope with me for an impromptu bodyweight workout. This one occurred in the gazebo with a Mama Robin keeping watch. She had a nest full of eggs just to my right (you’ll see it at the end of the video). This was super quick, sweaty and fun. Did I tell you I’m giving away ALL my digital programs? Yup. When you coach with me, I’ll provide access to any of my workout programs. Let’s see if we’d be a fit to work together here.